I watched the New Horizons flyby of the Kuiper Belt object now called Ultima Thule on NASA TV live when it took place (about 5:30 AM GMT on January 1). I thought about posting something beforehand, but I knew it would just be some NASA boffins sitting in a room in front of monitors talking to each other, then either expressing dismay or celebrating. Which is exactly what happened, with the celebrating part rather than the other. It would take at least a day or so before anything was downloaded and converted into usable images. Ultima Thule was intriguing because previously it had shown a variation in its albedo (reflectivity), but as New Horizons approached the information sent back showed no evidence of such variation. The route of the spacecraft meant that its approach was from a different angle than what had been available previously. The first images published were described as showing an object shaped like a bowling pin. The Kuiper Belt object Ultima Thule takes on a bowling pin shape (left) in this view from the New Horizons spacecraft taken on Dec. 31, 2018 just before its flyby closest approach on Jan. 1, 2019. At right is an artist's sketch of the object. . . . It is approximately 20 miles long by 10 miles wide (32 kilometers by 16 kilometers). This explained the discrepancy between earlier observations and New Horizons data. New Horizons was approaching from the "side" of the bowling pin as Ultima Thule rotated, while previously the view had been from either the top or bottom as it rotated. 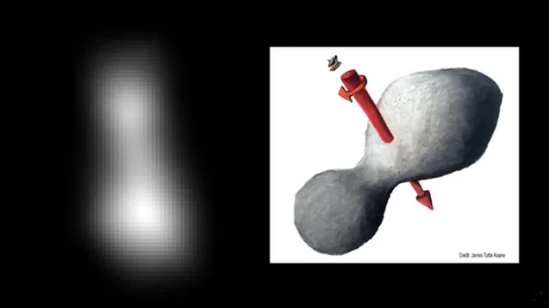 When the data from the flyby had been processed, it became clear that Ultima Thule was not a bowling pin, but more like a snowman. New Horizons is a miraculous vehicle. It is a tribute to human ingenuity and the determined quest for knowledge. It's things like this that make it worthwhile getting up in the morning.